Cleaning fish, disembowel, is good to wash. To rub salt and pepper inside-outside. In a round form for baking to infuse into vegetable oil, lay out fish, inundate sour cream. 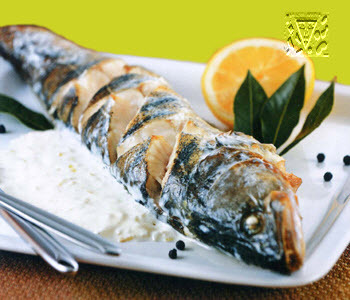 To bake fish tebese in an oven, warmed-up to 200ОС, during 15-20 minutes. To clean onion, finely to cut. To get a form from an oven, to cover fish a onion and bake yet about 15 minutes. To serve a dish up hot, not shifting in other tableware.